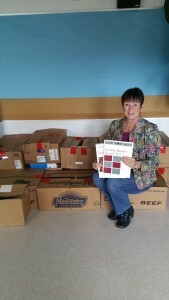 Paul Finnegan Dickinson, who graduated from Pittsfield High School and is a retired educator, has donated 527 books from her professional library. We are so grateful for the donation of these books, which will become part of the Pittsfield School District’s professional library, potentially of benefit to over one hundred educators. She has meticulously organized the books in alphabetical order and provided us with a spreadsheet of pertinent information for each book. Thank you so much, Paula!